In human society animals have very little worth as sentient beings. Sure, we value them as a food source and we don’t hesitate to use them as tools when they can make themselves useful. However, on their own, as living creatures that exist and have needs, we care for them very little. I am sure everyone reading this knows this fact as well as I do. And we are all guilty of it in various forms. For instance, I am probably not going to rush to the aid of a magpie but I would probably help a fellow human, even if doing so put myself in danger. I’m not saying this is right or wrong, it’s just the way things are. Obviously some animals have more public worth than others. It’s all relative. While I may be indifferent toward magpies, others may see them as beautiful creatures for whom it is worth risking one’s life. North American society in general values different animals than does Asian. Dogs and horses are probably near the top of this list. And it’s understandable. Humans have a long history of working and living with those two species. Furthermore, dogs and horses have become incredibly useful in our evolution. They are tools who have a very large return on investment. Dogs aid humans in countless ways. There are police dogs, military dogs, disability assistance dogs, and therapy dogs. We put them in shows to raise our personal status. They are our companions and family members. We put pressure on governments to protect their welfare. We license them and write by-laws to keep them off the streets. We train them and play with them and judge others for not training and playing with them enough. What baffles me is that there is another species who has been domesticated and has evolved in a similar way to dogs but has almost no value in our modern society. Like dogs, we raise them in our homes, buy them toys, and post pictures of them on the Internet. Yet the public at large grants them minor worth. These animals are abandoned every day in terrifying numbers, left to fend for themselves without even any by-laws in place to pull them off the streets. Of course, as per the title of this post, I am talking about cats. According to The Canadian Federation of Humane Societies out of over 84,000 cats admitted to shelters in 2008, over 45,000 were killed. 45,000. It’s a frightening number. Those are just the cats lucky enough to make it to a shelter. How many cats were killed on the streets? There is no way to know. There is no record. For whatever reason, cats have a negative connotation. They are associated with “crazy cat ladies” and hoarders. They are bird-killers like Sylvester in Looney Tunes. They ruin gardens and harrass our dogs. They are a public nuisance on the level of raccoons and Canada geese. Even as pets we dislike them. Cats hiss and scratch and destroy our things. They are too independent. Cats do what they want and can’t be trained. They aren’t affectionate and loyal like dogs. They don’t greet us at the door when we come home. Of course, if we treated our dogs with the same negligence we do our cats, they’d probably react much the same way. Cats are far more tolerant of us than we deserve. The title of this post is misleading. Cats are definitely not dogs in any physical way. As I’ve discovered, they don’t think in the same way either. My point is that cats can and should have just as much value as dogs. Both as pets and as useful helpers. Perhaps there will never be cats in the military, but I don’t see why they can’t help children learn to read like dogs do in multiple literacy programs. I am sure cats can provide assistance to people with disabilities and give comfort to hospital patients, just like dogs. I’m making it a mission of mine to help change public perception of what I think are loving and useful creatures. Even my own fumbled attempts at bonding with my cat have blown me away. 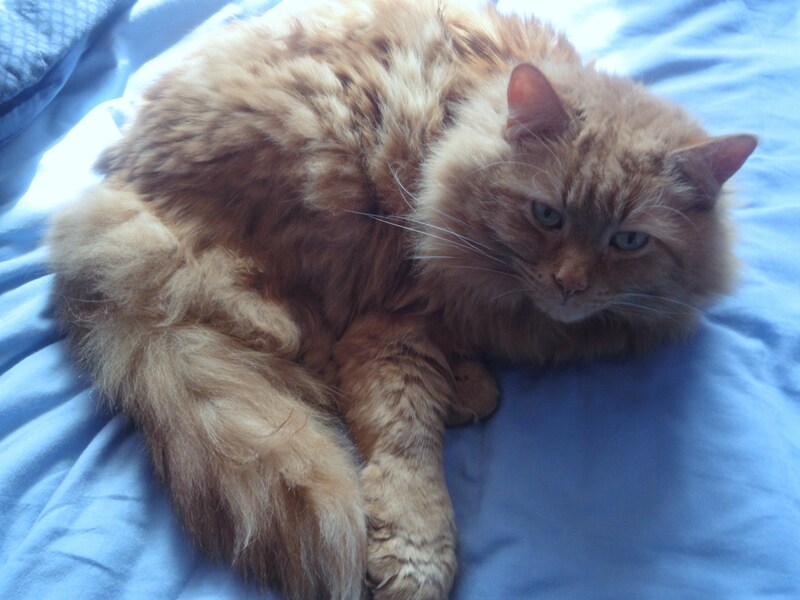 I like to think I can prove that not only are cats trainable – even older, grumpy ones like mine – they are just as intelligent, just as affectionate, and just as much fun as dogs. There is one caveat. I am just one person. If I am going to show the world just how awesome cats are, I am going to need your help. For this Blog the Change for Animals I am asking for submissions of photographs, stories, videos, drawings, letters, haikus, or whatever other creative mediums you can come up with that showcase the importance and value of the cat. I am hoping to collect as many as possible to share in July’s Blog the Change Event. If I get enough, I’ll share them in multiple posts. I’d love to make the celebration of the cat a regular feature. After all cats have endured, I think they deserve it. Don’t you? If you love cats and have something positive to share, please respond in the comments or email contact@rescuedinsanity.com. Let’s show the world how worthy these beautiful animals are! Great post, close to my cat-loving heart. In our home, if it wasn’t for cats, we wouldn’t have dogs, I’ll follow up on your challenge and explain soon. What an awesome mission you are on. If I come across anything, I’ll be sure to forward it to you! Because I have a dog sanctuary and no cats, people, including rescue people, assume I don’t like cats. I DO! I had cats and horses long before I had dogs. So, here, here, for cats, kittens and all felines – esp. tigers :). Although I am a dog person I’ve written many posts about the little cat who wormed her way into the home and hearts of assorted humans and four dogs in our household. I will admit that I laugh at some of the jokes involving cats in peril, but I think one reason is that to humans if we will be honest, we think cats are superior to dogs and probably to humans. The independence they show can be hard to deal with when we think we are all benevolent by the favors we bestow on the animal world. This is a good blog the change. i am looking forward to hearing some of the commentators. I love the idea of this post! All to often cats are left behind and expected to fend for themselves . .I can’t imagine doing something like that ;( Those are the same type of people that get a cat and NEVER let the cat in the house . .it makes me sad. I’ll be sending you some stuff!! Great idea! Cats definitely deserve and need more respect in modern society. They probably have saved the human race from the plague many times over, and that is just one of their big contributions. I’m always looking for cat- and pet-related stuff for my blog too. Feel free to browse my blog and use anything you see, and I’ll keep my eyes open for you too. As far as teaching cats tricks, have you seen Nana and Kaiser on YouTube? Or the new cat Moogly the Bengal? And the Popovich Comedy Pet Theater? Cats can do tricks if people will invest the time and attention to teach them. I stopped by as part of BTC4A blog hop. Great post! Awesome post Kristine. I have always been a dog person, until I got my two cats. They got me through a lot of things. 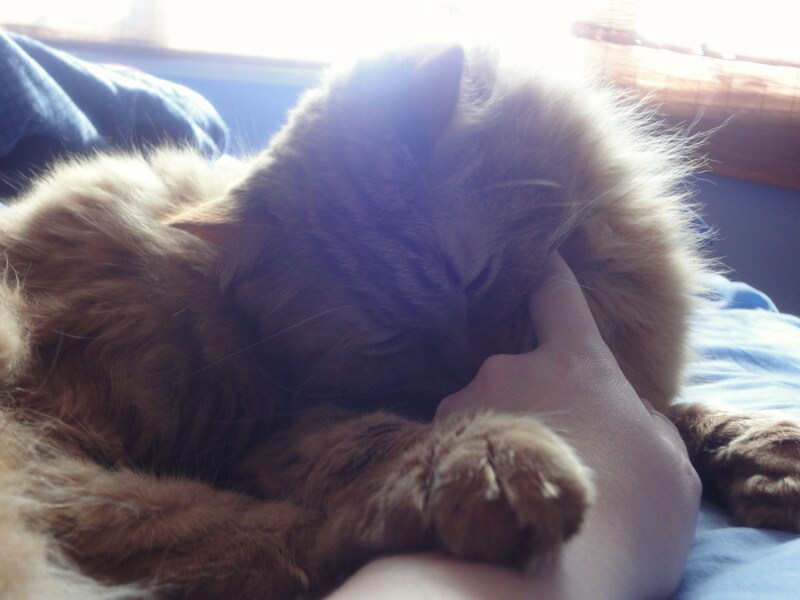 I loved that Sebastian used to curl his paw around my hand before we went to sleep. I loved that Nick was always jumping in the tub and yowling until he got me to turn on the faucet. I hope you get tons of pictures and stories and haikus or poems, etc. What fun it would be to see all of them in July. I may even send one in of Nick too! LOL, yes, cats are dogs too. I love cats and wish we had at least a few. I’ll wrack my brain to think of what kitty things I might have of my old Tibby or of our cat Pete. He’s not as cool as the Cat though. I’m in love with the Cat. Thank you for the thoughtful post. I also don’t understand the casual attitude many people who have cats take toward them. A college friend of mine thinks I’m insane for the way I’ve spoiled my dogs. But I can’t understand how such a caring and compassionate person can be so nonchalant about going out yet again to scrape up the remains of one of her cats from the road. I just want to shake her and ask if she feels any responsibility for keeping the animals in her care safe. I’m a little afraid of cats–it’s a claw thing. But seeing how much Honey loves some of the dog-friendly cats in the neighborhood might be changing my mind. I’ll definitely be on the look out for cat-friendly tales. Fantastic, pro-active, and GENIUS post! I love this idea and please don’t hesitate to ask for submissions from the BTC Facebook page. I’ll put the call out on Twitter now too. I can’t wait to see the results, Kristine. Kudos to you! Brilliant. Good job Kristine, I”ll keep a lookout for cat stories I can forward along. Awesome cats I agree with you that cats are really like dogs too. Cat can also be a mans best friend. A friend said that our cats are like dogs & our dogs are like cats. Two of our cats greet everyone at the door, while the dogs would prefer to go the other way. My husband wasn’t a big fan of cats until we got the first two, but they became his little buddies in no time. His only concern about getting a dog was that it had to get along with the cats. I hadn’t considered the idea of therapy cats, our 2 greeters would probably love it! The dogs will probably never be up for that, they were nearly feral when rescued. They’ve come a long way, but the cats have a huge head start! It is simply beyond my ability to view anyone who could hurt a kitten as an example of humanity. At that point they become irredeemable monsters in my mind. It’s just a switch that goes off and, right or wrong, I know I’ll never be able to change that in myself. Awesome mission you are on. If I come across anything, I’ll be sure to forward it to you! Hi Kristine, I love cats. Especially that one down the street that likes to rub up against me. Great post! 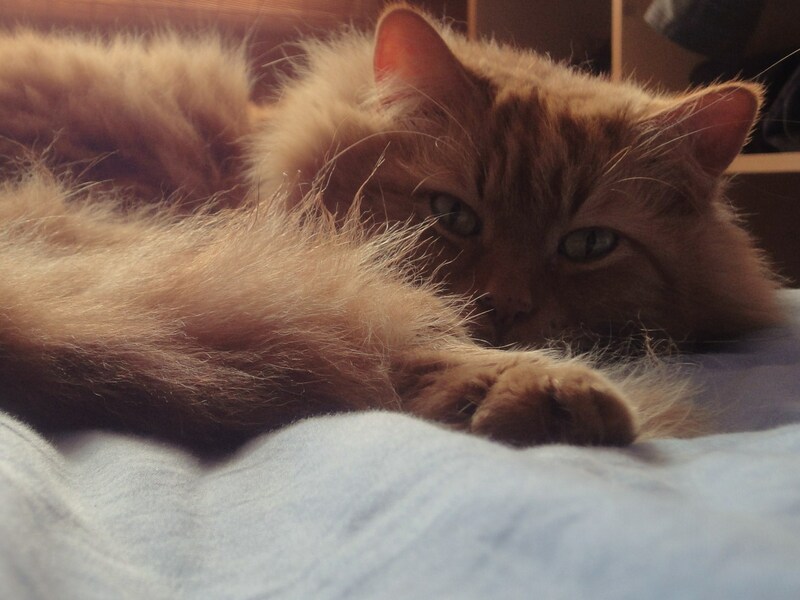 Although our dogs make it to the blog most often, we love our kitties just as much. Looking forward to your presentation in July! As a dog lover and owner, I am very much against animal cruelty. In the news last night, an organization for animal welfare had caught a group whose responsible for dog fighting. I am so happy to know that they were put in jail because of their acts. My heart was torn into pieces when I saw the dogs’ situation. They are so unhealthy and most of them are dying. I have been rescuing cats since 1995 and have had hundreds grace my life and show their unique personalities. I currently have one up for adoption and listed on Petfinder.com by the name of Slinky — she greets me at the door, plays fetch with her sparkly ball, bringing it back to me in her mouth (and meowing as she approaches to announce herself) and dropping at my feet to throw time and again, and has even walked through the pet stores on a leash! A very special tiger girl that will make some lucky family very happy one day with her entertaining antics. C is allergic to cats, otherwise we would have one (or two or more). Instead, I finally got my dog (Larry) small enough to curl up in my lap like a cat. Great project! I always feel sad when I meet someone who feels cats are evil, sneaky, worthless, etc. I’ve shared my life with more cats than dogs and they all have been special. I don’t know if you’ve posted your project on the Cat Blogosphere (a daily post goes out about what is going on in the cat blogosphere), but here’s the link – http://www.blog.catblogosphere.com/ if you haven’t.